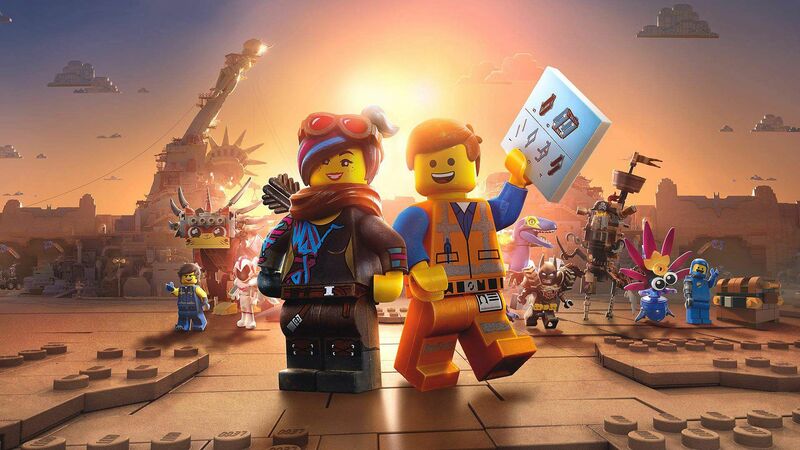 The Lego Movie 2: The Second Part picks up right where the first film left off five years ago. For those who don't remember, that one ended with The Man Upstairs (Will Ferrell) telling his son Finn, who imagines all the events in the Lego Universe, that he will now have to allow his sister, Bianca, to play with the Legos also, resulting in her Duplos (the double-sized version of Legos meant for smaller children) invading Bricksburg. This invasion is shown in greater detail here, and naturally, it's Independence Day-style. While the rest of the Lego characters start thinking about defence, Emmet (Chris Pratt), the eternal optimist, steps up and tries to broker peace. Spoiler alert: It doesn't work. Cut to five years later, and Bricksburg is now Apocalypseburg (yep, Mad Max: Fury Road-style) thanks to Bianca's Duplos swooping in periodically and taking away all the shiny pieces. All the Lego characters adapt to the grim, new reality -- Lucy (Elizabeth Banks) especially takes to it -- except, of course, good ol' Emmet. He builds a house for himself and Lucy -- a nice shiny one -- which seemingly attracts a new invasion from the Duplos. Only this time, the invaders take away all Emmet's friends, forcing him to go on a rescue mission alone. Much like the first film, there are pop-culture references aplenty here, and your enjoyment of the humour built largely around them will depend on your tolerance for and familiarity with the source material. What's different this time around is that the live-action portion, which takes place in the human world, which came as a reveal in the original, is integrated throughout this film and actually drives the entire plot. And since there are two human kids in the mix this time around, the film splits into two storylines -- one driven by Finn and the other by Bianca -- and the way these two threads collide, split apart and collide again is delightful. Big ups for the design and animation teams. The use of non-Lego materials like stickers for the Bianca-driven world, for instance, is inspired. It's also fun to try and guess whose point of view we're seeing when the two universes come together. The voice acting is mostly on point again. In addition to Emmet, Pratt also gets to voice a new character, Rex Dangervest, who is basically a mash-up of all the action hero roles he's played in recent times like Star Lord in the Marvel Universe and Owen Grady in Jurassic Park films. He does a good job with the former, but is a bit underwhelming as the latter. It's nice to see Elizabeth Banks get more to do, and Tiffany Haddish does great with the plum new role of Queen Watevra Wa'Nabi (There's a lot more of this sort of silly word play, by the way, and it does get a bit tiresome after a point). Will Arnett returns as Batman, and is every bit as funny as he was in the first film and The Lego Batman Movie. There are also some amusing cameos, which I won't ruin for you. The funniest character for my money though, is the one played by Richard Ayoade (of IT Crowd fame). I hope he returns if /when they make more of these movies. The film takes an interesting turn in the final act, which mostly works. I particularly appreciated the call-back to a beloved sci-fi classic in the end. Wish they'd avoided the moral science lesson though. The new spin on the Everything is Awesome song, however, is endearing and apt for today's world. And speaking of catchy songs, there's a new one in this that literally goes "This song's gonna get stuck inside your head." True to the promise, it did, but not for long. Within half an hour of walking out of the theatre, I found myself once again humming Everything is Awesome. This sequel is a lot like that new song - sort of works, but still leaves us yearning after the much better first film.